Yucca Valley Equestrian Center offers BLM approved pens and transportation for adopted wild horses. Cindy Lapp is an approved Mustang Heritage Foundation TIP trainer, as well as Top Ten Extreme Mustang Makeover Trainer. For information on adopting a mustang of your own, read on below. Follow Cindy's 90-Day Training Journal for taking a mustang from wild to wonderful! Step-by-step, with pictures in the gallery. This year: Mares! Follow Cindy's 90-Day Training Journal for taking a mustang from wild to wonderful! Step-by-step, with pictures in the gallery. Cindy's first year, with Wyatt. Thinking of adopting a Bureau of Land Management Wild Horse ('Mustang')? Your first stop is the BLM Wild Horse and Burro home page, which explains the program and the requirements, and provides links to Adoption Applications and other forms. The Mustang Heritage Foundation also provides information on adoption and mustang promotional programs, including the Trainer Incentive Program, or TIP. 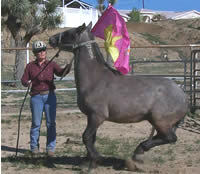 Cindy Lapp is an approved TIP trainer who can assist you with your adopted wild horse. The following FAQ can provide you with the straight facts to get you started, and help you decide if the program is for you. Please feel free to contact us (info at the bottom of the page) if you need more information, or would like to get started with your own adoption process! Yes, for all intents and purposes. They are born in the wild, rounded up and brought to BLM holding facilities. They spend their lives in a herd situation, with minimal interaction with humans. While in holding they are vaccinated and have basic hoof care, but none of this is done with 'normal' handling. The horses come to you basically untouched. They do not know how to be caught, or lead, or even allow humans near them. Everything has to be taught. What do they look like ? What type of riding are they good for? Mustangs come in all colors, but bay, chestnut, and gray are most common. Due to years of domestic horses being turned loose onto mustang ranges, a mustang can have almost any type of body style, depending on the range they came from. Typically between 13 and 15 hands, they can also reach 16 hands or larger. Some are heavy-bodied with thick necks, some are thinner and wispy. They are generally very intelligent and quick to learn. A mustang can be trained for any type of riding his body is suited for; there are mustangs competeing successfully in western, dressage, jumping. extreme cowboy, ACTHA and other trail competitions, and more! 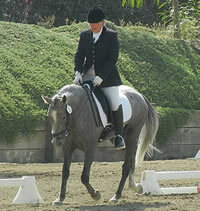 A TIP Trainer can hlep you choose the right style of horse for the discipline you enjoy. What is TIP? How does TIP work at YVEC? The Trainer Incentive Program was developed by the Mustange Heritage Foundation to promote the adoption of mustangs by providing certified, qualified trainers to assist new adopters. 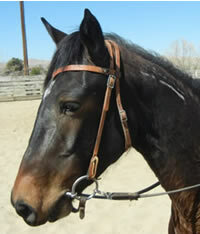 If you adopt through a TIP trainer, you get a horse that has basic training at no extra cost to you. Horses in the TIP program are generally 3 years old, can be a mare or a gelding, and any type or color though most are bay, gray, or chestnut. It is possible to adopt a younger horse through TIP, just bear in mind that the horse will not be able to be ridden until age 2 or 3, and you will be paying to feed and house him, as well as investing time in keeping up his handling and training, until then. At YVEC, Cindy will work with you personally to find the right horse for your needs. The BLM Ridgecrest Holding Facility is a 3 hour drive from the ranch. When you're ready to adopt, you can accompany Cindy to the facility to choose your horse, or just give her guidelines in what you'd like to see and she can choose for you. Once back at YVEC, Cindy will work with your horse to 'gentle' it; your horse will be trained to accept human touch, to halter and lead, to pick up and handle all four feet, and to load safely in a trailer. Your adoption cost to the BLM is still the usual $125 fee. (for full costs, see breakdown at the bottom of the page). Each horse is different so there is no hard and fast timeline for the gentling to be complete. Once it is, you finalize the adoption of your mustang, and begin your riding training! You can choose to stay in the YVEC training program at that time, or work with your horse on your own. 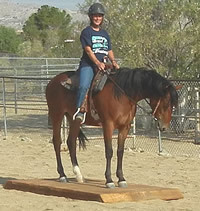 YVEC also offers the unique "Train the Trainer" program, so if you want to work your horse yourself, and are able to commit the time necessary for this, you can work with Cindy to learn how to do your own training. Do I have to use TIP, or can I just adopt a mustang on my own? You can always adopt on your own, and board with us at YVEC! YVEC meets all the BLM requirements for boarding newly adopted mustangs, and has the necessary style of stock trailer for transporting your horse to the ranch if needed. All new adoptees will be boarded in a PEN, as required by BLM (see Boarding for current rates). Once gentled, you can choose to board in a barn stall if you desire. Pasture board is not recommended until your horse is fully trained and can be reliably caught out of a herd situation. How will my TIP adoption work? Who really owns the horse? Once you choose to adopt with TIP through Cindy, you will sign our boarding and training agreement. Cindy will set up the appointment at the BLM to choose and pick up your horse. At the time of pickup, Cindy will sign paperwork with the BLM as the 'custodian' of the horse in question. Once she has successfully completed the training covered by TIP, she will notify the BLM that the horse is safe to adopt, and you will submit your adoption application to the BLM. You will receive notice in the mail that your application is accepted, and you will receive copies of the paperwork pertaining to your horse. For one year from that date, the U.S. Government will be the owner of your mustang (this is true with all mustang adoptions). During that time, you MUST notify the BLM if you decide to move to a new facility. If you cannot keep the horse, you can return it to the BLM during that period, or find a new approved adopter. During that first year, a BLM Inspector will arrive to see that the horse is being treated well and is in good shape. When the year is over, you receive title to your horse, and he is officially yours. At this time you can move or sell your horse in the same way you would any other horse you might own. How does this usually turn out? Is a mustang right for me? We would be glad to talk with you about your goals, abilities, and the best plan of action to make your mustang adoption a great experience for you. Feel free to contact us by email or phone, or if you are in the area, stop by to see us! As with any live animal, there are no guarantees. However, it has been our experience that these horses are smart and willing to please. If handled properly, they become dependable, safe riding companions with a lot of personality. As with any horse, the more time you have to invest, the more you are willing to learn, the better your relationship with your horse will be. Remember, once gentling is complete, you have a young horse that needs training, and for a few years after you begin riding you have a 'green broke' horse that still needs consistent work. If you are a beginner, you will want to learn more about riding and horse ownership in general, no matter what type of horse you have. Beginners can do well with mustangs, provided they are willing to put in the time to learn, and realize that learning is a lifelong journey with a horse, and all part of the fun! So what's the bottom line? How much does it cost? All general horse expenses apply for mustang ownership. Costs vary for hoof care, veterinary care, equipment, etc. The following chart will show you what expenses you can expect to incur; when you are ready to adopt we can help you find the most current prices for the various services. Board: in a pen to start. You pay board monthly, from the day your horse arrives at YVEC. This includes feed and stall cleaning. Our current board prices. TIP Training: your TIP training is FREE. Your horse will learn to be caught and haltered, to lead, to have all 4 feet handled, and to load in a trailer. Continued Training/Training to Ride: if you choose to continue training with Cindy after TIP, current training rates apply (call us for information). Adoption Fee: your adoption fee, which is the only price you pay to 'buy' the horse, is $125, paid to the BLM at the time of adoption. After 1 year you will receive title and the horse is yours. Trailering: you will pay for YVEC to trailer your horse from the BLM holding facility to YVEC. Veterinary Care: you are responsible for any medical expenses. Common expenses are vaccinations, worming, and dental care . Farrier: Your horse will need his hooves trimmed every 8 weeks. Depending on your sport, you may choose to have shoes put on when the time comes, but for general riding most mustangs do not require shoes. Tack and other equipment: For the pick up day, you will need a sturdy rope halter and an attached lead rope. Cindy can help you choose an appropriate style. You will eventually need a saddle and saddle pad, and a bridle. Because your horse is young, we do NOT recommend purchasing a saddle until you see what the shape of your horse's back will be and your riding training is progressing. If your horse is in training with Cindy, she can help you choose the proper saddle and bit to purchase when the time is right. Horse shows, Registration Fees: you do not need to 'register' your mustang, he will have a freeze brand on the left side of his neck that identifies him as a mustang. If you choose to participate in any style of horse show, you can register your mustang with the American Mustang and Burro Association, Inc. which gives your horse a registered name, and allows him to accumulate points towards year-end mustang awards. Still have questions? Ready to start? Stop by the ranch at any time to see the mustangs that currently board with us! Give us a call at the ranch at 760-365-4433 (leave a message, we are almost never stitng by the phone, but will call you back! ), or send an email to CAllenLapp@aol.com.